Don't be misled: No one makes a fool of God. What a person plants, he will harvest. The person who plants selfishness, ignoring the needs of others — ignoring God! — harvests a crop of weeds. All he'll have to show for his life is weeds! 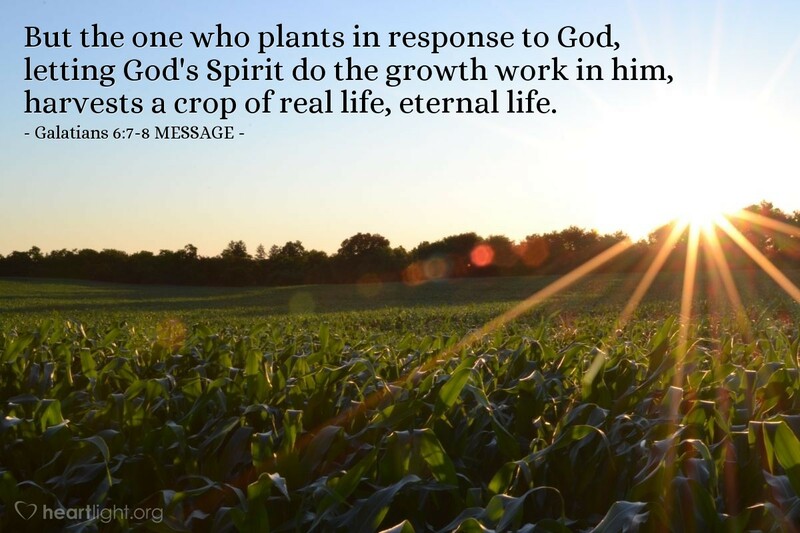 But the one who plants in response to God, letting God's Spirit do the growth work in him, harvests a crop of real life, eternal life. While we must commit to following Jesus as Lord, the power to bring growth in us comes from the Holy Spirit. Real life, the life that grows and matures and reproduces itself, is the work of God's Spirit going on inside us. The Spirit produces God's fruit in us and brings in God's ultimate harvest: "real life, eternal life." This growth work comes from the Spirit! Father, I love you and want to honor you with righteous character and holy compassion in my life. Yet I confess, the more I try to produce this character and compassion on my own — without depending on your strength, your word, and your Spirit — the more I fail. I find myself prideful of my accomplishments or resentful of others and their accomplishments, or I just simply fall back into my sinful and addictive behaviors. So I offer my heart, my body, and my mind to love you, and I offer myself as a living sacrifice. As I do this, I ask that you fill me with your Holy Spirit and empower and guide me by your Holy Spirit, who brings true life. In Jesus' name, I pray. Amen.